Gao Shengke and Wang Kai have won the prize for Best Investigation at chinadialogue’s and The Guardian’s China Environmental Press Awards - 2013 for their investigation into contaminated earth in Chinese cities. Here is the first of their three-part series of reports. The excavators are rumbling and dust swirls all about at the second phase of the Kangquan New City construction project in Guanzhuang village, Chaoyang District, outside Beijing’s east fifth ring road. A 20-metre deep pit has been dug on the site. A foul stench rises from the pile of earth that has been removed. Until now, few people knew about the secret that was buried here. This plot of land was previously the site of a factory owned by the Ministry of Railways that made anti-corrosive railway sleepers. The plant was in operation for more than 30 years; many kinds of organic pollutants continuously seeped into the topsoil, deeper soil layers, and into the groundwater. Some seven or eight years ago, the factory was relocated and this plot of ground was left unused. In January 2011, the city administration decided to convert the land into a development for affordable housing and it was taken over by the Residential Construction Service Centre for Civil Servants to build low-cost housing for civil servants from all ministries. After the Civil Servants Residential Centre took over the plot, a number of specialists carried out an initial land survey. In May 2011, the Chinese Research Academy of Environmental Sciences released a public environmental impact assessment report which made no mention of any soil pollution problem. There was also no mention of the historical use of the site or the original environment. However, Caijing magazine got hold of another similar survey report by the Chinese Research Academy of Environmental Sciences, which showed that pollutants in the soil seriously exceeded approved levels, especially semi-volatile organic pollutants such as polyaromatic hydrocarbons. There were many kinds of hydrocarbons, most of them relatively strong carcinogens and mutagens. Furthermore, the groundwater pollution was also relatively serious. The report said the most serious pollution occurred at a depth of between 0 and 7 metres, though at 12 metres pollutants still exceeded limits. The problem of polluted land extends far beyond Beijing. After 2001, a large number of polluting enterprises were moved out of the Yangtze River Delta, the Pearl River Delta, and the old industrial bases of China’s northeast. In 2008, the central office of the State Administration of Work Safety insisted that highly-polluting chemical enterprises should be phased out. Research undertaken by Luo Yongming, a senior soil expert at the Chinese Academy of Sciences, showed that from 2008 countless polluting companies relocated from Jiangsu, Liaoning, Guangzhou, Chongqing, and other areas, displacing over 20,000 hectares of contaminated land. From 2004 to 2012, Chongqing relocated 137 polluting factories. Furthermore, these factory sites are mostly now prime real estate locations. For three consecutive years, Jiangsu relocated more than 4,000 heavily polluting chemical enterprises, leaving behind a large area of land with unknown levels of pollution. Exactly how widespread the problem is in China is unclear, but a senior industry specialist pointed out that there must be tens of thousands of plots of polluted land nationwide; of these pesticide plants occupy quite a high proportion but only a miniscule number of these have been treated or are undergoing treatment. In Beijing, for example, between 2001 and 2005, 142 factories were relocated, displacing 8.78 million square metres of reusable land. According to Li Jingdong, section head of the polluted land management department under the Beijing Bureau of Environmental Protection, from 2004 until now, only a few dozen contaminated sites have been identified, out of which only eight have been remediated. Because of a lack of both facilities and awareness at old state-owned factories, pollutants were handled in a fairly basic fashion. In those days, pesticide factories usually just buried pesticide residues and harmful chemical residues onsite, just five or six metres below ground. A lot of land that was treated this way still has high concentrations of pollutants, sometimes hundreds or thousands of times above set limits. These days “the number of plots of land that have been identified as polluted still hasn’t reached 100,” says Jiang Lin, associate director of the Beijing Municipal Research Institute of Environmental Protection. There are about 400,000 to 500,000 polluted sites in the US. Europe also has several tens of thousands of sites. Cheng Mengfang, a researcher with the Institute of Soil Science at the Chinese Academy of Sciences, pointed out that in China a lot of contaminated ground has not been treated or remediated, it’s just directly exploited for development. Polluted soil endangers the human body both directly and indirectly. The indirect channels are through groundwater, surface water and the atmosphere. The direct channel is through dust in the air or when children play and without paying attention absorb some of the contaminated soil. Since the mid-1990s, polluted sites in China have led to an excessive amount of acute poisoning incidents. As the rate of land development has accelerated, these kinds of accidents are becoming more frequent. On April 28, 2004, at the construction site for the Songjiazhuang subway station at the south third ring road in Beijing, three workers were poisoned while underground. They were sent to hospital, while the worker with the most serious condition had to be given hyperbaric oxygen therapy. A pesticide factory previously occupied the site. In July 2006, at the site where a chemical factory was moved from Guoxiang, near the south ring road in Suzhou, Jiangsu, leaving behind 20 mu of contaminated land, six construction workers fell into a coma after diggging up a pile of contaminated earth. 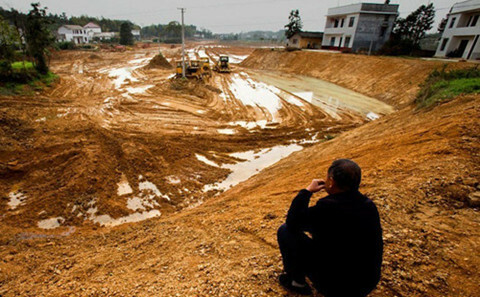 During Spring Festival in 2007, at the Heshan construction site in Wuhan, a pungent stench grew stronger after a deep layer of soil was excavated. One after the other, the workers began to feel dizzy and have difficulties breathing. Because they didn’t know what the problem was, they carried on working. Finally, several of the poisoned workers were sent to hospital for emergency treatment. This was the former site of a pesticide plant. A professional in pollution remediation who took part in the sampling of the site of Beijing Chemical Factory number 2 described how toxic gas was continuously emitted from a pipe. The gas could be ignited with a lighter, which showed that the concentration of the pollutant was high enough to cause fatal poisoning. Even though some plots of contaminated land have come to light, news about them is strictly blocked. It is only for internal discussion by specialists and closed-door decision-making by the government. A specialist who has taken part in many soil remediation projects gave the example of a commercial building site in Guangzhou that was formerly the site of a key fertiliser factory, and where heavy metals and petrochemical pollutants both exceeded safety levels. This site was chosen for Guangzhou’s Asian Games Village. The pollution problem was only discovered after an investigation and so finally the Asian Games Village was moved to Panyu District. However, the residents of the construction site were never told the truth. A senior industry insider disclosed to Caijing that a particular industrial plot in Shenzhen was the original location of a large number of electronics companies. After these companies were relocated, they left behind a serious amount of solid waste pollution. All the offices on this plot of land currently have no idea. Even the local government doesn’t have a clear idea of the extent of the problem. Wang Kai is a journalist at Caijing magazine. The pollute first, pay later model is catching up with America, now forced to finance ever-mounting clean-up jobs – like this one in the ghostly mining town of Picher. Kristi Eaton reports. Beijing’s informal recyclers – often new arrivals from the countryside – make a priceless, though unacknowledged, contribution to the city. Here, Chen Liwen introduces a series of photos depicting their way of life.